Copyright (c) 2007 by Rae Kaiser. All rights reserved. The newest addition to the Outside the Line collection of picture Doodle fonts... Christmas Doodles. The perfect font for that quickie Christmas party flyer. It includes gifts, gift tags, gingerbread man, gingerbread house, candy canes, hot cocoa, bow, crackers, 2 kinds of trees, poinsettia, jingle bell, ornaments, snowflakes and a star. 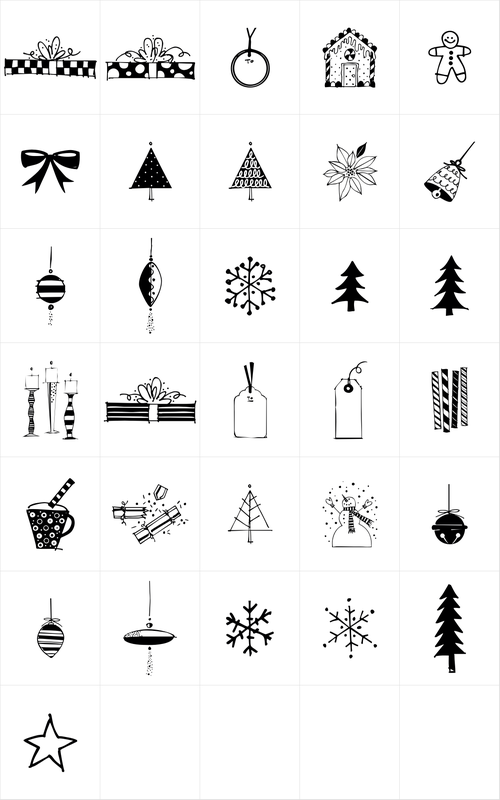 This font works well with Holiday Doodles and Holiday Doodles Too which have some Christmas icons in them.